The NYSE is the world's biggest stock exchange. 2. What Type of Market Is the NASDAQ? 3. What Kind of Stocks Are Included in Nasdaq? The New York Stock Exchange (NYSE) is the largest stock market in the world, by far. The NYSE, often referred to as the Big Board, is almost three times the size of the world's second-largest exchange, the Nasdaq. The Nasdaq is an American exchange, founded in 1971, and like the NYSE, it's based in New York. The rankings are based on market capitalization, which is the total value of all the stocks on each exchange. 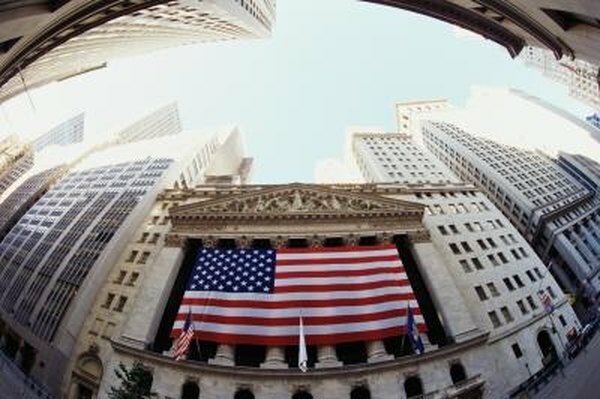 NYSE's market capitalization was more than $13 trillion in mid-2012. The Nasdaq checked in at $4.5 trillion and the Tokyo Stock Exchange, which ranks third, came in at $3.4 trillion. More than 90 percent of the companies that are on the closely tracked Dow Jones industrial average stock index are listed on the NYSE. More than 80 percent of the companies on the S&P 500 index, also closely tracked, are listed on the NYSE, as are more than 80 percent of Fortune 500 companies. The other two exchanges in the top five are the London Stock Exchange and the Shanghai Stock Exchange. Other large stock exchanges include the Hong Kong Exchanges, the Bombay Stock Exchange, TSX/Toronto Stock Exchange and BM&F Bovespa of Brazil. The NYSE started small. It traces its roots to 1792, when a group of merchants and brokers met beneath a buttonwood tree in New York and entered into the Buttonwood Agreement. They started out selling just five securities. In 1817, a formal organization called the New York Stock & Exchange Board was organized, and it rented rooms on Wall Street. In 1863, it became simply the New York Stock Exchange. As the nation grew into an industrial giant through the 19th and 20th centuries, the New York Stock Exchange grew along with it. As a result of a merger in 2007 of the NYSE Group Inc. and Euronext, which operates an electronic stock exchange in Europe, an entity called NYSE Euronext was formed. That company, which is a for-profit public company, also owns the NYSE Euronext Europe, which is also among the top 10 largest exchanges in the world.